I always hate to pack up all the Christmas and then clean up all the mess, plus every room seems to need attention with some kind of new vignette and decor. 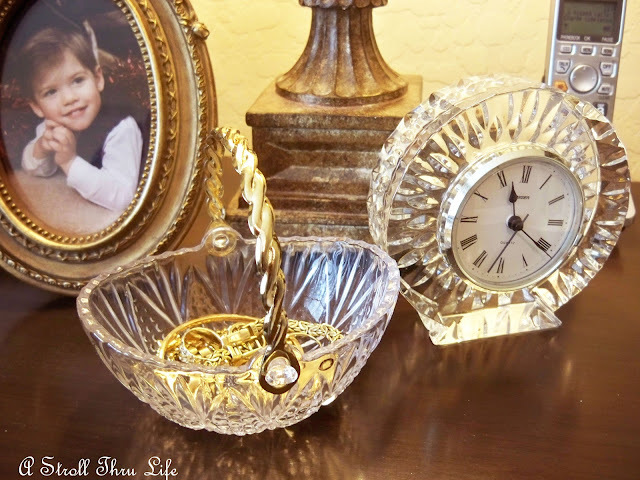 This year the Master Bedroom only had a small vignette on the dresser, so cleaning that up was super easy, so I started with easy. lol Out with Christmas and on to cozy for winter. I received this gorgeous pillow for Christmas from my daughter and it is totally perfect for the bed. I think it is stunning. My mink throw is perfect for the winter months, and I love to snuggle under it. 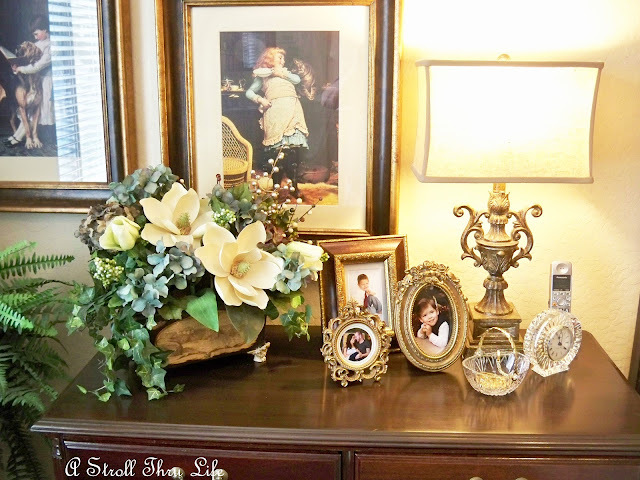 A simple and easy vignette on the dresser. I found this wonderful crystal dish before Christmas and it is perfect to hold my everyday jewelry. I always love to see pictures of my grandchildren. Always brings a smile. 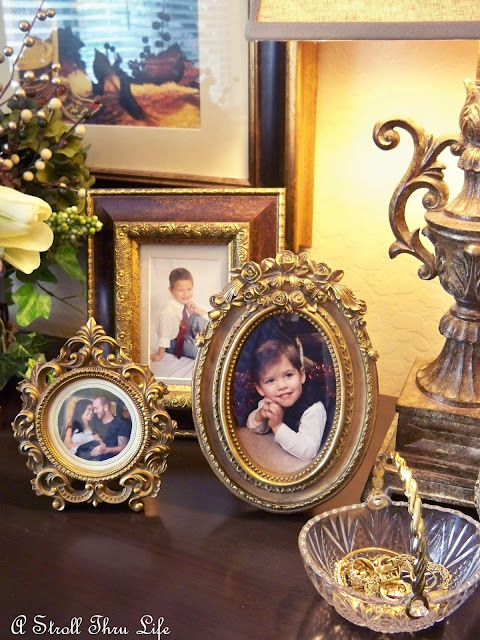 so a few glitzy frames add just a touch of elegance. 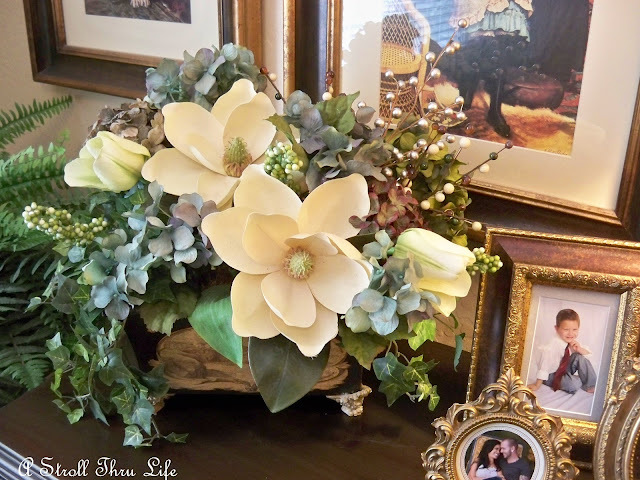 This is a floral arrangement that I redid with more aqua and cream. Perfect colors to go with the pillows on the bed. Simple and easy, just my kind of style. Ok, now I need to tackle the rest of the house. How about you, are you taking your Christmas down? Lovely bedroom! I'm a bit slow with taking things down today. It's been a lazy day just relaxing and ( for ME ) reading posts. 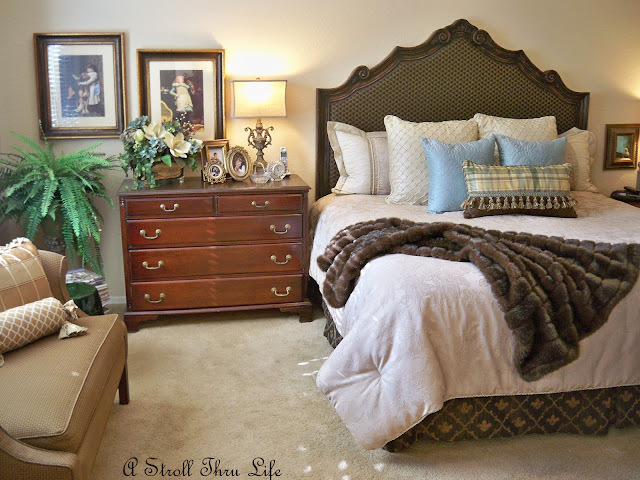 Just found your blog... beautiful bedroom.. I am going to follow along for inspiration....I hope you will stop by and follow along with me too. Blessings! Yup I took all the Christmas things down earlier today and got back to normal. Your room is soo lovely and cozy ! Happy New Year ! Your bedroom looks very pretty, Marty. The pillow is lovely and I especially like the gold frames with family photos. It is a lot of work getting it all put away, I agree. I think I will be vacumming pine needles for months hehe. Wishing you all the best in this New Year. Happy New Year Marty!! 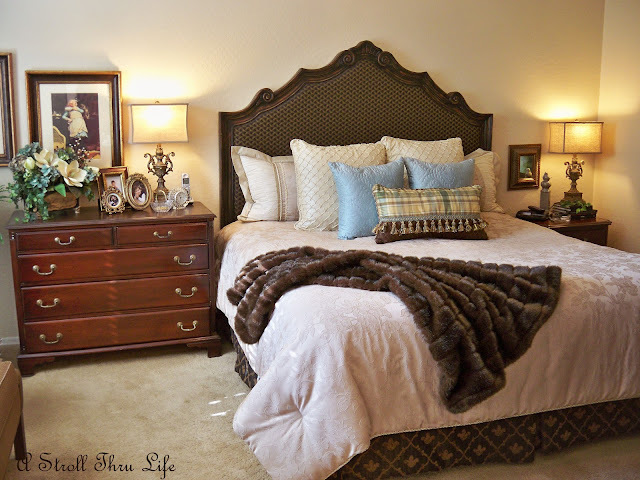 Your bedroom looks beautiful! Can't wait to see more! Very pretty and cozy! I dread the thought of cleaning up Christmas! Your colors are so pretty for the bedroom. I worked on the easy part today but have a long way to go! Happy New year! Your room is beautiful Marty! I love the pillow from your daughter and love that bedding! Lovely, as always! Thanks for sharing!! wow that is a stunning pillow. that rooms looks better every time I see it. enjoy every moment. Marty,you have such a talent for placing everything so that it looks just perfect. The pillow your daughter gave you looks great on you bed. What good taste she has! I just love the mink throw, too. Looks like you're getting a jump on the New Year by jumping right in and getting things in place. Good for you! I put all my Christmas away over the weekend. It wasn't too bad this year since we didn't even put up a tree! I am drooling over that beautiful pillow! 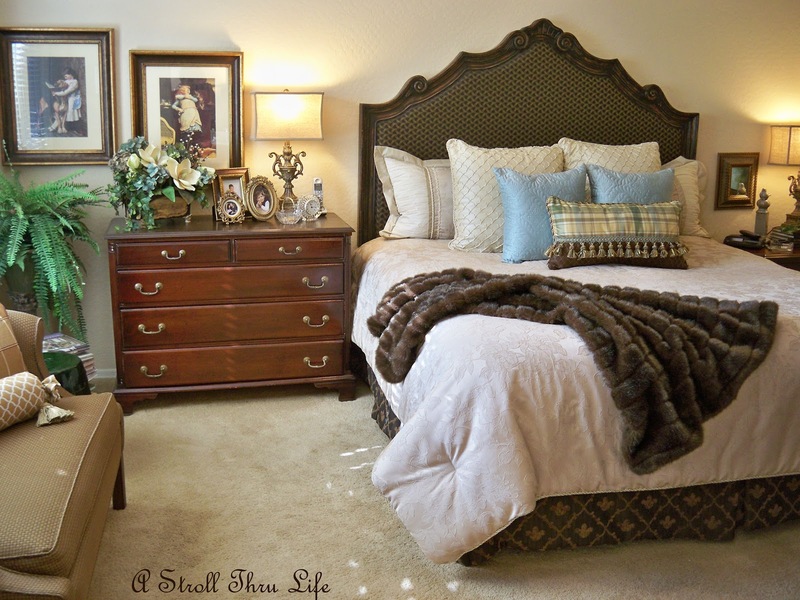 I love the calm, soothing colors you've used in your bedroom! Happy New Year! Marty, I just love your blog header! It just made me happy to see it. I think you do a wonderful job in your home too--hope you've know that for a while. Happy New Year. We normally take the tree down today BUT Mr is under the weather. Love your mink throw! Your daughter in law has great taste, beautiful pillow. Your bedroom is so peaceful and so very tidy. 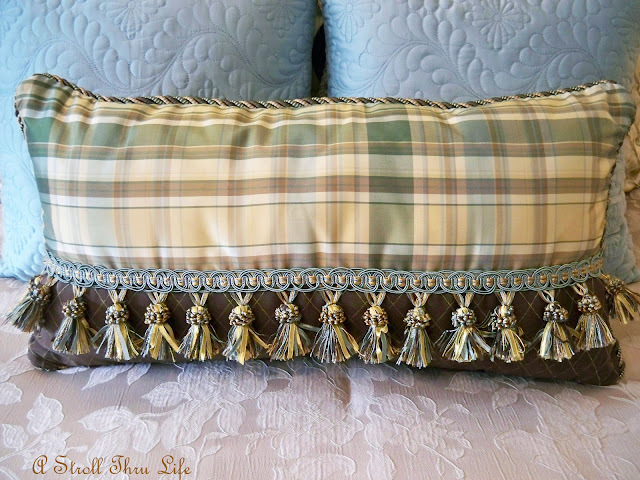 The pillow your daughter gave you for Christmas is lovely with its soft fringe. Very pretty room. I didn't do too much decorating this year so it was so easy to put it away... wow, I may never do the major holiday stuff again! Beautiful and relaxing bedroom...Love it! You have the most beautiful bedroom dear Marty and the new pillow your daughter gifted you, is really stunning! Have a happy and blessed 2013. It all looks wonderfully cozy and just beautiful Marty! Happy New Year! Your bedroom is lovely and that new pillow is SO beautiful! We keep everything up through Epiphany - all through the Twelve Days of Christmas, so I'll have to tackle that task next weekend. Good idea to start with the easy room, Marty! I will start to put my stuff away tomorrow. I was up way too early today taking my son to the airport and I know I'll be napping by 2! : ) Love your throw ~ it looks like the perfect snuggling throw. Simple and easy...elegant and classic!!! Your vignette is stunning! I adore the hues in your floral arrangement and the new pillow is gorgeous!!! Always inspiring!!! Now, I'm off to re~work the side table in my Master Bedroom!!! Your bedroom looks beautiful and I love that pillow it is so gorgeous. The throw is an eye catcher too. I just love the new pillow. Gorgeous. We took everything down New Year's day. I'm happy to have the house all cleaned up. It feels so much bigger with everything put away. Happy New Year! Your bedroom is gorgeous, of course! Marty...love your bedroom and the pillow is so beautiful..what a great gift...Starting the Christmas "tear down" next week....I like your idea of doing the easy room first!! Ohhhh! That Mink throw looks very cozy. I would love snuggling under it too. Your new pillow is perfect. I love the way it brings all your colors together. I didn't have much to put away, but it still takes awhile, because I clean and fluff as I go along. It's always more fun decorating than taking it down. We have done some of our biggest remodel projects after Christmas because it always looks a little blah. Marty, your bedroom is so pretty and so very cozy! Your room is absolutely gorgeous. Are you sure you aren't an interior designer? I like your one room at a time approach, I am going to adopt that for my deep cleaning schedule...one room at a time seems a lot less overwhelming! 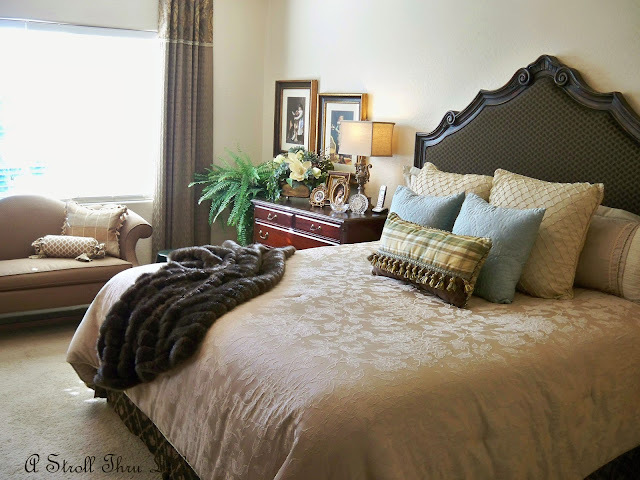 Your bedroom is so cozy and inviting, a haven for rest for sure!